The Scottish Rural Development Programme (SRDP) - News from Brussels and Edinburgh! If you want farmers to read what you have written or to turn up to a meeting tell them how to make or save money. There weren't enough seats at last week's SRDP "Roadshow" in Oban for just that reason. Although it hasn't all been finally approved in Brussels we were told what the Common Agricultural Policy is going to paying us for from 2014 until 2020. Wrapped up in all of the Brussels Speak and Scottish Government Speak ( these are two quite distinct languages impenetrable to the uninitiated) we were told that not much has changed. The Single Farm Payment (with a slightly different name that I can't remember) will continue along with the "Less Favoured Area" payment will still be paid but varied according to the land quality. Basically the farms on the better land get more and the biggest farms get the biggest proportion of the cake plus ca change. Incentives to create more woodland, projects to mitigate greenhouse gas emissions and more money for younger Crofters (those under 41 or as one speaker said, "those with age related issues" ) mean there's something for everyone. But only once we have re-registered with SGRPID and we have done the returns on line. For forty years I have been a sceptic about the value of organic farming and organically grown food. I argued that the population had never been better fed than in the years following 1939 and that people had never been more neurotic about what they ate. I was wrong! A large, peer reviewed scientific study carried out by the University of Newcastle and reported in the, British Journal of Nutrition, has shown that organic food has a higher nutritional value than its non organic counterparts. There are health benefits including protection against, cancer, cardiovascular disease, diabetes and neurological disease. I should add that Dormouse has been buying organic food for years, more recently from Riverford Organics, despite my scepticism I do find it tastes better, could be her cooking. Eleven out of twelve fertile Bresse Gauloise eggs hatched but the fertility was only 67%. So I can't sell any yet L'll have to check the fertility again in a week or two. When people buy hatching eggs they have high expectations. Often unrealistic expectations. There are just so many factors that can affect how many chicks you get from a given number of eggs. This is especially the case when the eggs are sent by post. Rough handling of the package, big changes in temperature and changes in atmospheric pressure when they go by air can have serious effects on fertility and hatching. So I have to ensure that the eggs are as near 100% fertile when they leave here in polystyrene boxes by express mail. To make hay, especially in small bales you need five or six days of good weather, an assortment of machines and a labour force. For us here in Kilchoan its actually more economical to buy in small bales of hay. We need straw for bedding and oats or barley for stock feeding so we buy that too. About once a month in winter Ronnie comes up to Salen from Falkirk with his lorry and what ever we need. It's an excellent service and good quality hay. The loaded lorry doesn't have to negotiate the 20 miles of single track road to Kilchoan and its a short trip for us with pick ups and trailers. Another example of the resourcefulness and cooperation needed by people in remote crofting communities. Crofters need a day off and a day out from time to time.. Yesterday we made a slow start by taking the gondola up on to Aonach Mor where could start a walk at 650 m above sea level, above the clouds and in the sun. Even if you are a Polar explorer when you get to 65 you have to start the new mountain season slowly. The "Explorer" and myself weren't feeling too energetic. . We strolled along to the viewpoint at Meall Beag where photographs were taken then a plod up the ridge in knee deep snow indicated that a coffee was needed. Time spent on reconnaissance is never wasted so we'll return on a long,hot June day to complete the two Munros, Aonach Mor and Aonach Beag. The Year of the Goat, an early celebration. The Chinese Year of the Goat starts on the 19th February but our goats were celebrating early. Today was the first time they've been outdoors since early December . The sun was shining, the snow on Ben Hiant luminous, there was a gentle breeze......perfect! In Chinese astrology the goat is a symbol of peace, harmony and tranquillity, I can't argue with that. You will notice that the above image is much better quality than usual. It's down to the guest photographer and his superior kit. Survey of crofting confirms what we already knew, crofting is a lifestyle choice. The Scottish Government has recently carried out a survey of crofting income, expenditure and activity in the, Survey of the Economic Condition of Crofting 2011 - 2014. Forty per cent of the 2000 Crofters who were sent survey forms responded, so 800 responses have to represent 18,000 crofters the results are not surprising for anyone living in a crofting community. Twenty five percent of us live alone, many of us are over 65 years old. We work, on average 12 hours a week on the croft. Those with jobs in addition to crofting work another 49 hours a week. So we are a pretty hard working lot even those of us who are classed as retired. 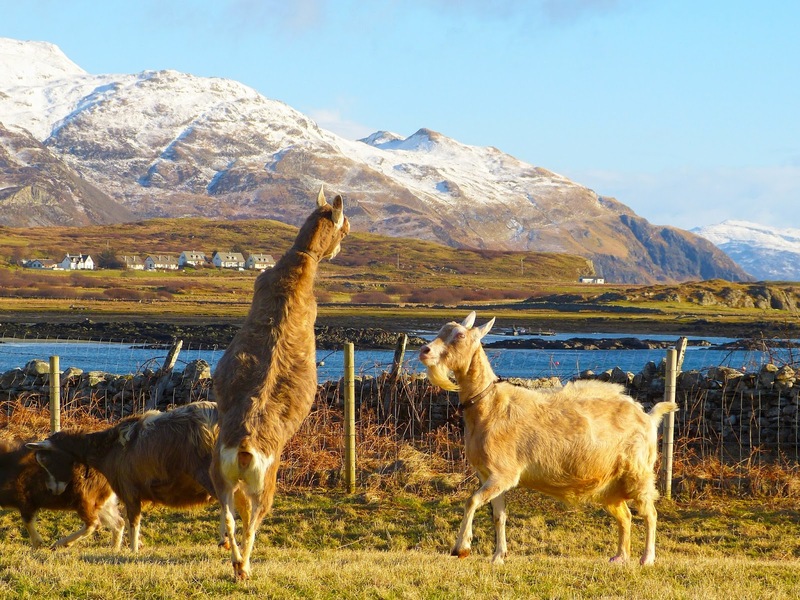 We raise livestock in 73% of cases, our median income from crofting is £2,000 p.a. and median expenses £1,500 p.a. After expenses that is an hourly rate of less than £1 an hour. This is the median group so some people will be earning even less and some more. Obviously we don't do it for the money so why do we do it.? It has to be a "lifestyle choice". You can read the report at; . http://www.scotland.gov.uk/Topics/farmingrural/crofting-policy.